So much is on the go, the country is a buzz with change. The best thing about the up and coming 2010 soccer world cup is the camaraderie it brings. Stop anyone on the street at any time and say in what ever language you speak, the words 2010 and you will be rewarded with a smile and 2 thumbs up! Durban is my home town and I am living right on the coast line overlooking the Indian ocean, the workman are busily improving every corner of the city. Jobs have been created and proposals are being written as people are believing in their ideas. 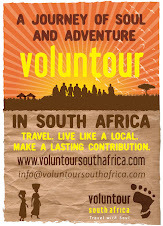 It is exactly this kind of energy that we at Voluntour South Africa are harnessing.